You know, the helmet could be better Just kidding, awesome skin. Did you make it all from scratch? Aaaaahhh Lauri you're getting too good. Traditional Rhûnic architecture, taken over by Khôragan. 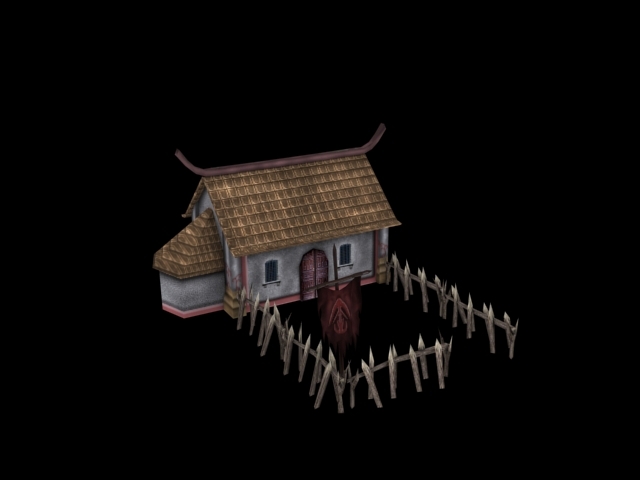 The mod will feature 3 kinds of Rhûnic architecture, traditional, buildings built by Khôragan, and traditional buildings taken over and changed to Khôragan's needs. The farm is relatively unspoiled, the only thing evil about it is the banner to show that it belongs to Khôragan. All from scratch. Edited by Matias, 18 August 2007 - 01:09 PM. Both of those are amazing. Well done. Beautifulness! cant wait to see more! "When you cease to exist, then who will you blame?" Loving the skins. It's good to see you back at it for this mod. yay eldaravir's horse looks a bit strange, might just be the angle. These men of Pinnath Gelin are awesome! Very original looking, like their crest. love them, that's some good work, seirously i love them espially Eldaravir. Not too fond of the Axemen's clothing , but other than that ; Nice.